You'll recall that the Los Angeles Police Department made a few, um, errors in judgement during their massive manhunt for Christopher Dorner earlier this year, perhaps chief among them shooting at a truck driven by two innocent women. Now those women have received $4.2 million for their trouble. The Los Angeles Times reports that attorneys on Tuesday reached a settlement in the case filed by Margie Carranza, 47, and her mother, Emma Hernandez, 71. The city council must approve the action. While the women were out delivering newspapers on Feb. 7, officers shot their blue Toyota Tacoma multiple times when they drove it past a house police were guarding. 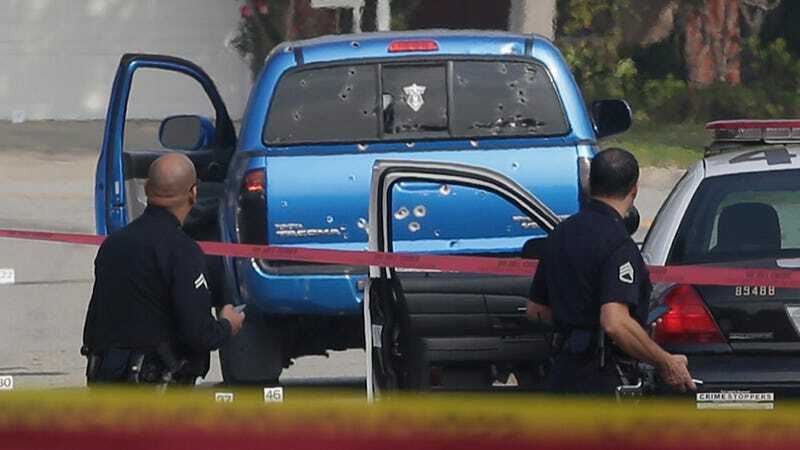 Supposedly, officers mistook it for a gray Nissan Titan that Dorner was said to be driving. Hernandez was shot twice in the back and her daughter was wounded by glass. Jonas said his starting point for the negotiations was $15 million or $16 million, but said the agreement insured that the women received a timely payment and avoided potential risks of going to trial. "I have a 71-year-old client. You think she wants to risk the appellate court reversing it for one reason or another?" Jonas said. "$4.2 million means a lot more to her today than potentially $7 million 10 years down the road." Trutanich called the agreement a "no brainer because the costs were going to skyrocket." "We got out of this thing pretty cheaply all things considered," he said. In addition, the two women received $40,000 last month from the city to replace their truck, which they reportedly spent on a loaded Ram pickup. At first the city wanted to give them a new truck, but then they would have had to pay taxes on it as if it were a game show prize. What say you, Jalops? Is this a fair settlement for getting shot by the cops?